I love this definition of yoga from one of my first teachers, Sharon Gannon: “Yoga is the state where nothing is missing.” When was the last time we felt nothing was missing? Maybe in utero. The term satya means “truthfulness” in Sanskrit. So many of us are lying to ourselves; we’re putting an identity out there that we want other people to see, and we’re hiding, from ourselves and from others, who we truly are. In truthfulness as in yoga, nothing is missing. We are present, whole. When you navigate the inner landscapes of your body through breath work, mindfulness, and postures, you notice if what you have just said, done, or thought makes you feel lousy or good. One day several years ago, my four-year-old nephew, Johnny, was talking to my oldest brother, Mark. Johnny said, “Uncle Mark, I really love everyone!” Mark replied: “Really, Johnny? I don’t love everyone. In fact, I even have enemies.” Johnny shook his head and said, “That’s too bad, Uncle Mark. You must feel so bad inside.” This awareness is the first step toward right thought, right word, right action, and maybe even peace. It could be that simple. One night, my husband, Rodney, and I were surfing YouTube videos when we stumbled on a video of a Fiona Apple concert. It was an “aha!” moment for me. I thought: This woman is telling the truth with her body. She’s not what you would typically call a good dancer, she was jerky and unconcerned about looking pretty, but something about her was raw and real. She was moving with her wounds, with her limitations—she was moving truthfully. She wasn’t hiding, and she wasn’t afraid to be vulnerable and expose herself through her voice and movements. Her courage and honesty made her dance mesmerizing and powerful. It penetrated something deep inside me. When you bow to someone and say, “Namaste,” it means, “The deepest part of me acknowledges the deepest part of you.” Fiona Apple’s performance was a Namaste from her body to mine. I want to have the courage to be as honest in my life, my teaching, and in this book as she was in that dance. The goal of a yoga sequence is to create a physical effect, an emotional effect, and a spiritual effect. The key is to investigate and listen to your body, to increase intimacy with it in order to understand cause and effect. What sequence of poses, breath work, and meditation creates greater peace? (Not just peace in our joints, but peace in our guts, our hearts, our nervous systems, and our lives.) We’re all “sequencing” every day. If you need to drop the kids off at school and go to the bank, the post office, and the grocery store, you figure out an optimal order in which to complete those tasks. When it comes to the body, the same lessons apply. Yoga is skill in action; part of that skill is learning the right sequence, on and off the mat. Colleen Saidman Yee is an internationally respected yoga teacher who has been teaching since 1999. For twenty years before that, she was a top fashion model working around the globe, represented by Elite and Ford Models. Colleen opened her first studio, Yoga Shanti, in Sag Harbor, New York, and she and her husband, Rodney Yee, have studios in New York City and Westhampton Beach, New York. With Donna Karan and Rodney, Colleen created and runs the Urban Zen Integrative Therapy Program, which is utilized in healthcare facilities around the country. Saidman Yee has been featured in The New York Times, New York magazine, Vanity Fair, and O, The Oprah Magazine, among many others. Mother to a daughter and three step-children, Saidman Yee teaches retreats, workshops, and conferences around the world, but calls Sag Harbor her home. "Colleen Saidman Yee is an extraordinary yoga teacher and human being. And the genuine item. Read this book and enjoy her incredible story— and the healing power of yoga!!" "There are so many maladies that keep the body and mind from working optimally. Colleen Saidman Yee tells us her story and how yoga has unraveled the knots that have been stored from different traumas and everyday life. The yoga solutions she offers are a first aid kit that we should be schooled in. This book is a must for your library of home health." 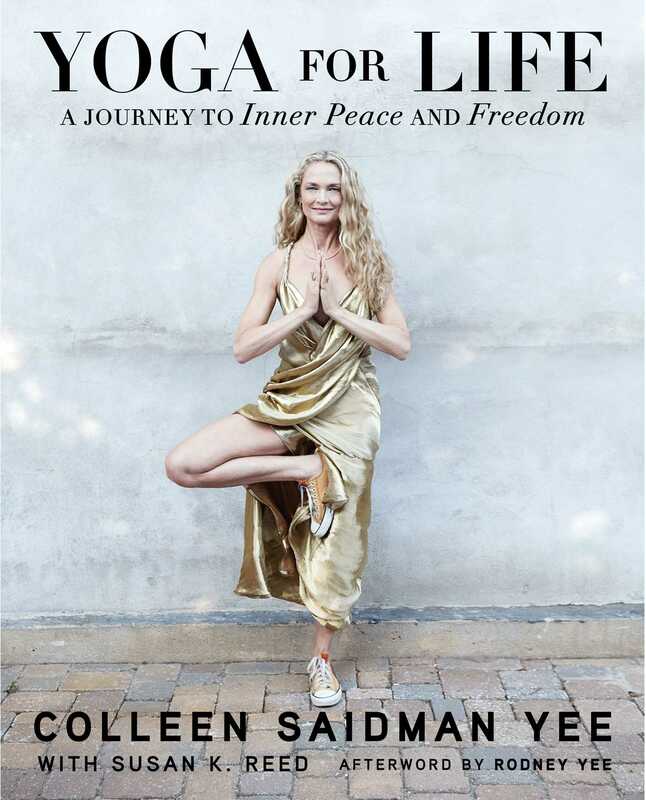 "Colleen Saidman Yee’s life has been a wild ride that, thankfully, led her to yoga. Her story, her insights, and her yoga sequences will improve your emotional, physical, and mental wellbeing, and help you onto the path of peace and freedom." “Colleen touches my heart from the inside out. She inspires me as a woman, a mother, and a girlfriend, always coming from a place of love and kindness. Her teaching is that yoga is as simple as a breath. Reading her book is like having a woman-to-woman conversation with the Colleen I know and love -- an honest, nurturing, and encouraging friend who shares and cares with all her heart. It is a powerful wake up call to the spirit within, with real down-to-earth strategies to empower yourself through this beautiful journey called life." "In Yoga for Life are fantastic instructions and sequences for feeling and releasing the stories and games that bind us. Colleen's confessions and experiences teach a compassionate embrace of the shadow. They let you feel the frightening underbelly of who you think you are. I highly recommend her book to anyone wanting to be free." "Courageous.Compelling. A yoga book you can’t put down! Saidman Yee writes with ease and honesty and by example invites us to look at, embrace and embody our own complex life’s circumstances in light of yoga and in context of others. I highly recommend Yoga for Life--a wonderful book for our times." "Colleenis a strong, empowering woman who I look to for sisterhood and wisdom. She has used every crazy twist and turn of her own life to find her spiritual center,and now she teaches us how to do the same. In Yoga for Life, herunfiltered honesty will break you open and give you courage to find personalfreedom as you reevaluate your own stories. Colleen's funny, moving andcompassionate approach helps women set down their shame and pick up theirvoices. Her work has helped me to find more joy and contentment through asana,honest self-reflection, and loving kindness. This book is a treasure."